Getting across the border was easy...making the car legal to drive in Alberta was a little more complicated. First, you need to have an Out of Province (or in this case, Out of Country) mechanical inspection done. It took a few phone calls to find out that the big car dealerships really don't want this kind of hassle. Canadian Tire seems to be your best bet. They'll do it for $159.99 and they helpfully overlooked the fact that I didn't have an operational heater so I could get on with the process. 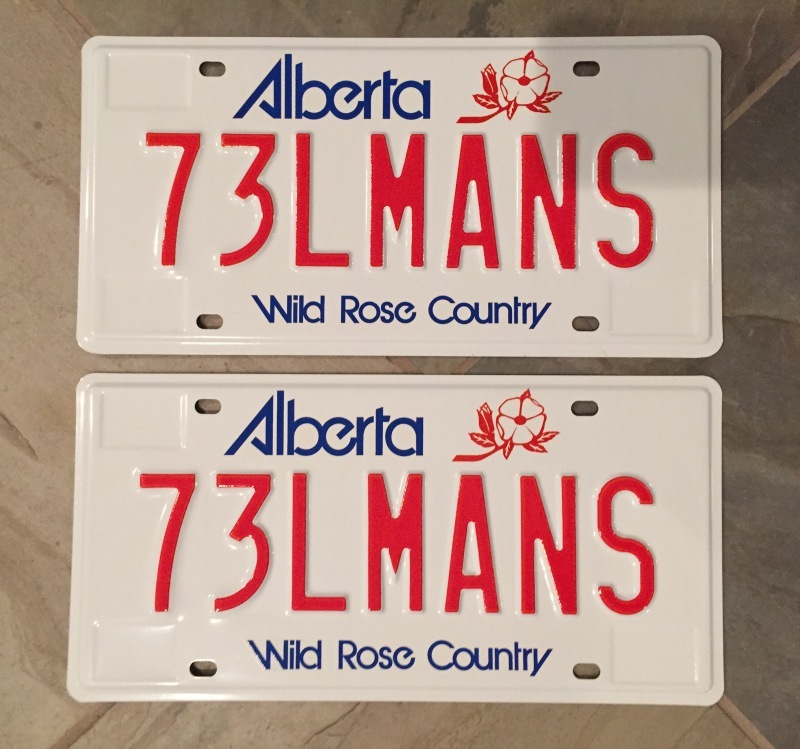 Once one has an inspection in hand, one can go to any Alberta Registry to get an Alberta title and a license plate. You'll need the old title (in this case the Illinois title that Bob the Seller had signed and surrendered to me), the importation papers you received from Johnny Canuck at the border, the signed Bill of Sale and the inspection report. And of course you’ll need the $84.45 it costs to register a car for a year in Alberta. In return, you’ll get a single, solitary, random Alberta 'Wild Rose Country' license plate to decorate your vehicle with. It goes in the back. As a point of interest, (because of course it’s not done that way any more), the rear license plate on the '73 LeMans attaches to a spring-loaded metal plate that pulls down to reveal the gasoline filler cap under the rear bumper. In other words, in order to fill the tank, you need to squat down, flip the license plate forward and down, remove the filler cap and insert the nozzle. If you are very clever, you wedge the filler cap between the license plate and the car to keep the plate down and out of the way while pumping. Hiding the filler tube under the licese plate was a neat way of not interrupting the lines of the car body in 1973, but time seems to have decided it's better to put up with a little door up on the flank of the car, rather than having to squat down and reach back under the bumper....especially true as those of us old enough to have owned a '73 start to get cranky knees and backs. I admit it. I’ve long been one of those curmudgeons who thought personalized, or ‘vanity’ car license plates were a ridiculous waste of money for egotists. I was inarguably correct about that until the day I realized it would be cool to have one on MY car! (Then it became a vital registry service). It’s a simple matter to order them at a Registry, for a one-time fee of $210.00. There are over 80,000 such plates in Alberta now. It takes about two weeks for Rocco and Knuckles at the Provincial Correctional Facility in Drumheller to stamp yours out and send it to you in the mail. The online registry service allows you to type in the plate you’d like and see if it’s already bespoke. (Go ahead, fire it up and see if anyone has taken 'STDMUFN' yet, you know you want it). There are almost 5,000,000 vehicle registrations current in Alberta. Apparently I'm the only person in the province who has a sufficiently soft spot in his head heart for the '73 LeMans , because virtually any variant was available. So what to choose, what to choose? Could't have 73LEMANS because they limit you to 6 digits. That left 73LEMNS or 73LMANS as logical choices. I chose the latter, with a few qualms about having to put up with LEMONS jokes from the unwashed. The front bumper now sports a replica 1973 Colorado license plate MT-1945. This was the license plate registered to my original 1973 Pontiac LeMans from 1972 until I sold it in the summer of 1981. The car is registered in Alberta, Canada. However, the province of Alberta only requires ONE license plate in the rear. Therefore you can put anything you like on the front bumper. I ordered my replica online for US$20.